Does anyone have any experience with shooting with the Ikonskop. I wanted to test it out and it is all but impossible to rent it in New York. What have people found the dynamic range to be and also how is the post workflow? Post workflow is straight forward in After Effects since it utilizes the Photoshop RAW editor. If you have RAW image experience or if you know a digital still photographer, you are in luck. * I do not work for Ikonoskop but I did get a camera loaned to me for testing Arri accessories. I have presets in my free de-Bayer program for the Acam dII (tm), and you can use manual colour correction for any lighting conditions as well. Someone in Germany is sending me some reference frames under Tungsten light the last few weeks, he says he will so some daylight ones as well. I may add some additional presets in my de-Bayer program for their sensor type when I have time later. If you want me to make a sample conversion of one of your DNG frames you can email it to me, I can send back the colour correction file (WBC KCC) that you can use maybe to process your own frames. People tell me they can run DANCINEC.EXE (tm) on a MAC if they have windows installed as a co-OS. Based on the sample DNG I have off their web site, the dynamic range seems to be limited by the multi-readout from the sensor making a dividing line in the image as it looks a bit above the noise floor. I have FPN masking in my de-Bayer program that might be able to mask that out but have not gotten the needed dark field calibration frames to see if that works well as there may still be some contrast or colour shift at the boundary. It might be possible to grade the half's or quarters separately then re-combine them, I have composite features for that sort of thing. The splits issue is not so important for normal exposure, but if you over-expose the CCD can show vertical streaking at some stops above white clip, CMOS cameras don't generally show streaking. The colour quality is quite good and clean looking when processed in my de-Bayer program because I have chroma filters built in. It has a global shutter so should be good for its intended hand held use, but at 24 or 25fps you still get more motion blur than shooting with a 60p camcorder so you need to use slower pan rates. If you want to see what the sample Acam dII (tm) DNG look like processed through my software someone posted the frame 40100002.BMP on their forum. The others you can maybe make for yourself. If you want instructions on my free de-Bayer program or freeish uncompressed DI system you can email me. I have samples de-Bayered and edited in my NLE of the KineRAW-S8p (tm) on my Vimeo page, but the Acam dII (tm) has cleaner colour and less highlight noise and being larger gives crisper results, but my Brother thinks the KineRAW-S8p (tm) sensor looks a bit more film like. Different sensor makers probably use different dyes in their Bayer filters, so there are some differences maybe, and the CCD has a larger fill factor so the microlens array has maybe a different impact. They seem to have adjusted the calibrations since the first test DNG were put up on their site, as the frames I have from Germany show the black level set very low and slightly off balance, that may have done that for the Adobe (tm) workflow (or to hide the splits) but native sensor data usually has the black level set higher in the RAW data to allow for temperature drift and not to cut off the lower side of the sensor noise. You can look up the rated dynamic range on the Kodak (tm) CCD sensor web site. I'm not sure if they ship the camera with an OLPF installed or not, it seems early tests were made with just a IR filter if I understand things right, so you may want to check aliasing and chroma moiré and ask them if the camera you get has an OLPF+UV/IR cut filter installed. You can download their test frames to check any workflow you want to with, that way you can know what you are likely to get with your own footage. I think Cineform (tm) as a DNG to Cineform (tm) converter so you can use the GoPro (tm) workflows as an option as well probably if speed is the issue. How the hell does the angled viewfinder work? Is the VF display literally at an odd angle to the camera's main axis, or is there some kind of prism or lens-shift that corrects for it? If not, jeez... I'd hate to have to do a walking shot with it. I'm shooting a documentary piece with it tomorrow, so I'll have some more in depth notes later. From the few preliminary tests I can tell you the image is very rich, and the workflow is quite slow without a reader. The guys at Ikonoskop told us not to think of it as a conventional camera. Once you've engrained that thought, it is much easier to work with. My buddy in NJ is supplying the camera. PM me for his contact info if you're looking for a rental in the NY area. Hi I have shot a promo on the Ikonoskop. Make sure you have new card readers, the old one was awful. And the camera was slow at transfer. The menu system is more simple than a Alexa. It's viewfinder is clear, but the power tap is where your cheek should go so can make hand/ shoulder work un comfortable. The image is also 16mm like in its depth of field. So if you client is expecting 35mm depth, make them aware of the way the camera will work. Obviously some kind of conspiracy is afoot to avoid answering this question. I infer therefore that the Ikonoskop's finder image is, in fact, awkwardly angled. IMHO, it's a shame that, once again, ergonomics have been sacrificed to some abstract design concept. Seems to me it wouldn't be rocket science for this camera to incorporate a swing-out or slide-out finder that would remain in line with the camera's axis. Just as it was with the finder-door Arri’s, like the 16S and IIc? I myself wouldn't write it off without trying it. >>Obviously some kind of conspiracy is afoot to avoid answering this question. Yes Dan, it's all about you. The camera is really small and in particular really short vertically. The shape is such that one can hold it like a fat pencil. It is incredibly comfortable. When the camera is on one's shoulder, it barely rises above one's chin. So one can tip one's head down a little and the viewfinder lands at a very comfortable spot with no strain to the operator. The image appears appropriately rotated for proper horizon perspective when operating this way. This is not a new idea. A relatively recent example is the Aaton A-minima. It works really well. I suggest you give it a try before dismissing it as I believe you will be pleasantly surprised. I've been in touch with the guys behind this camera for years, actually back when they made their 16mm camera. I can assure you that function and ergonomics are their #1 design concerns. >>Just as it was with the finder-door Arri’s, like the 16S and IIc? Having used many of those I can't say that that relatively shallow angle was ever an issue. The Ikonoskop finder, however, *seems* to be set at a more extreme angle, which is why I was wondering whether it incorporated some compensating shift-optics. >>I myself wouldn't write it off without trying it. I wasn't writing it off... just trying to get some straight poop on it. So I figured throwing a puerile tantrum and making a stink would finally knock some info loose. It seems to have worked. The DII seems like an *extremely* appealing little camera, so I'd certainly love to try one. In addition to its obvious compactness, I especially appreciate its extreme simplicity. >>Yes Dan, it's all about you. >>I can assure you that function and ergonomics are their #1 design concerns. Good to know. If I end up visiting NY in April I'll come by and have a look. I doubt there's one in the Bay Area just yet. The only flies in the ointment seem to be that during the camera's gestation, the rise of the generic SSD kind of makes their proprietary cards less appetizing, and that smaller sensors are a bit out of fashion. The small camera combo of the moment I would think is the new Nikon D800 plus a Blackmagic Hyperdeck Shuttle 2 and a set of CP.2's, the whole kit less in US$ than the A-Cam dII body only in Euros. 1) The sensor is CCD with global shutter and shows nice clean colours. 2) It records 12bit DNG so there is little banding and no mosquito noise. 3) It seems portable and easy to hand hold. Its file 40200001.BMP put up by someone who used my de-Bayer program with one of their sample frames. 1) Not using mixed illumination which seems to have been the case as the right and left sides of the guys face do not quite match in the colour of the light making the shadows off a bit in hue. 2) A dark field set of frames was used to make the dark field calibrations so that the exposure could be reduced a bit to hold more highlight detail without the FPN showing much. 3) A long set of frames was processed with temporal noise reduction to reduce any grain noise on the background and such. 4) Using temporal noise reduction could allow relaxing the area noise filters to let more fine detail through since the noise would be cut later so that the net result would be more detail at about the same noise level. Other programs could also be used to do the de-Bayer as well, and DNG it seems can be converted to Cineform (tm) for additional workflows. If anyone has sample DNG from Acam dII (tm) or Aaton (tm)'s 4K camera they want a sample conversion I can do one to TIF/BMP (or DPX if you need that) and send back the colour correction files so you can process your additional footage with the same corrections, perhaps. I don't do frame processing as a service, but if you can DIY, I do what I can to get something to you that works with the lighting you are using if I can. It's a pretty good little camera, it's small but the sensor is slow. It's useful for low budget work. Avoid the temptation to let your AC's attach to many accessories to it. You start off with a fantastically light small camera and by the time they've added an LCS, transmitter, monitor, bars and extra battery to power all this, it defeats the point of having a small camera. third-hand gossip. Have you actually used them? Nope, nor the D800, yet. But if BM never does get them to work reliably for everyone, then substitute the Sound Devices recorder for more or less the same effect. My point is, Ikonoskop is being flattened by advances in the HDSLR realm. >>How are the Blackmagic Suttles? I saw their display at NAB but all I've heard since is that there were >>reliability problems - just third-hand gossip. Have you actually used them? I tried the first Shuttle without problems, but returned it when the Shuttle 2 was announced. For an EX3 shoot, we went with the Atomos Samurai. The first one we tried crashed intermittently. The second is solid so far. It's more money, but has a nice display and can use spinning drives as well as SSD's. They have an HDMI to SDI converter coming soon with pull down removal which could work nicely with the D800 if you can stand ProRes. The Shuttle could also work as an HDMI/SDI cross converter. >>Avoid the temptation to let your AC's attach to many accessories to it. You start off with a fantastically >>light small camera and by the time they've added an LCS, transmitter, monitor, bars and extra battery to >>power all this, it defeats the point of having a small camera. Well, it's often the operator that wants us to use Remote Focus, it's you that wants to shoot wide open, i.e. necessitating a CineTape, etc. I thought the idea was that you get to START with a light camera so that even with everything added to it, it's still relatively light. 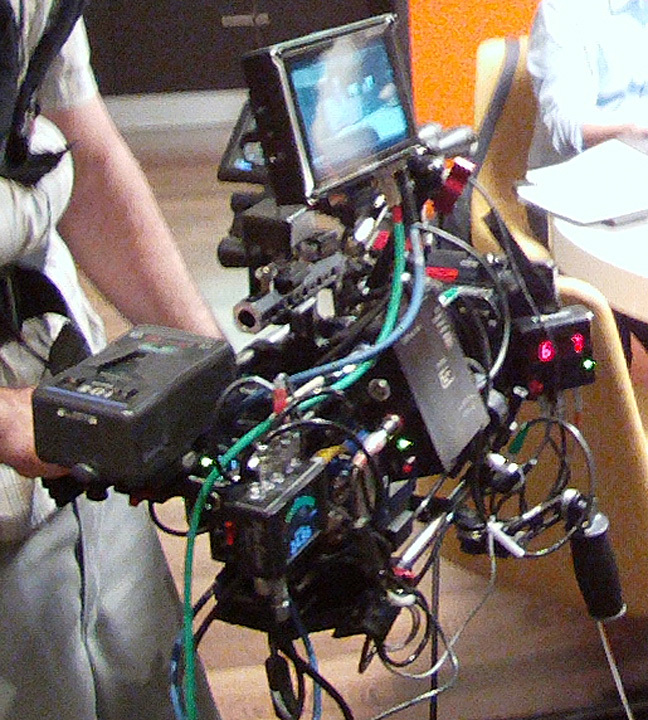 And it's not fun trying to mount all of the CAMERA DEPARTMENTS tools on these increasingly small cameras. They are OUR tools needed to get the job done in a quick, professional manner. ... just being the Devil’s Advocate. Not MY idea of Lovely and Light! I own an Ikonoskop and I am pretty happy with it. I have no trouble with the viewfinder angle, the camera feels natural and is incredibly compact. The viewfinder does have its problems for me, mainly I see rainbow artifacts when I move my eye, but you get used to that. The very compact size of the camera makes it ideal for shooting in situations where you don't want to attract attention. I friend of mine shot on a crowded market with a compact PL lens and nobody took notice. For longer hand held shooting the camera starts to get a bit uncomfortable because it's front heavy when a lens is attached and it's starting to strain your right thumb, because that's where the weight goes. I am looking at getting a shoulder mount for these scenarios. The images from the camera look incredible filmic and have a very nice aesthetic. You can run into some trouble with quadrant artifacts if you don't black shade properly, so be warned of that. The workflow is straightforward if you have a copy of SpeedGrade lying around and the images open up in Camera RAW or any other Adobe application that supports DNG. My only real gripe is the transfer speed from the camera via USB 2.0 and the fact that the new card reader only has an Express Card connector and a Mac driver. I do have Macs, but none with an Express Card slot and my HP mobile workstation which happens to have an Express Card slot is not supported because it's not a Mac. Combined USB3/Thunderbolt would have been nice. I'd be happy to answer any questions about my experience with the camera or refer you to someone who has actually been shooting projects with it (I am not a DP, so what do I know). Munich, Germany - Eng. Director for Adobe, guy who started IRIDAS and a few other things. >> Combined USB3/Thunderbolt would have been nice. I'd be happy with either one. Unfortunately, they're not the only ones who use obsolete Express Cards or proprietary file formats (HFS) which make transfers difficult. The only camera with either one (USB3) is the Nikon D800, and I doubt seriously that they will put it to good use (DNG). That would shake things up too much.